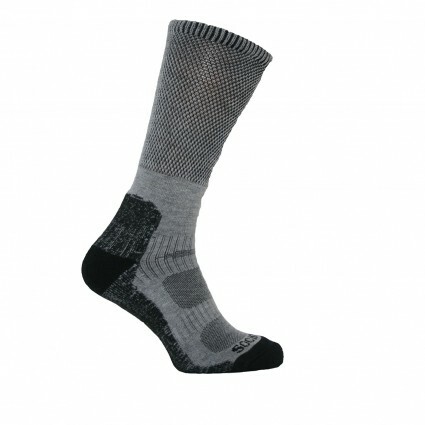 A friend of mine once told me that if your shoes rub when hiking it is generally not the shoes that are at fault but the quality of the socks that you wear under them. This particular friend is an ex-drill sergeant that failed to tell me this until day 2 of a 3 day hike around Dartmoor about 2 years back. During this particular jaunt my feet were cut to ribbons and needless to say that I have not worn the shoes since. The leather on my £150 Hi-Tec (not British made) technologically advanced premium pieces of walking wear has, in the intervening years, become iron hard. The very thought of wearing them again filled me with dread but because they cost so much I never threw them away. I was recently sent a rather snazzy looking pair of Sockmine Tread Comfort socks (complete with COOLMAX technology…which apparently wicks moisture away from the foot) and, with my friends advice about the importance of socks in mind, I decided to give them the ultimate test. Digging deep within a bag of old clothing stuffed in the darkest corner of the loft I found the much maligned boots, complete with bits of Dartmoor still stuck to them. After a quick beat on the back porch to get rid of the worst I slipped them on over the top of the Sockmines. Noting a brief break in the horrible weather, I decided, with family in tow, on a quick walk around Knole park (a local National Trust park). This, I thought, was a great way of getting some much needed New Years exercise and, of course, putting the socks through their paces. The socks themselves are surprisingly thick, with extra padding in key areas such as around the heel and ball of the foot. I received the size 9-11 and being a size 9-10 UK the socks fit well (arguably even better after the first wash). So, off we all set – Lucan and I running through muddy puddles, trekking through tall grasses and climbing the odd tree stump. It was only about an hour later, when Emily asked how my socks were, that I recalled one of the main reasons for our long walk. 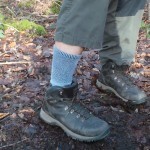 I honestly had forgotten that I was wearing my new sockmines and more to the point had had non of the expected trouble with the hiking boots. Indeed, after a 2.5 hour round trip walk (including a stop at the tea shop for cake) my feet felt fine. Of course this was not 3 day hike up and down the tors. 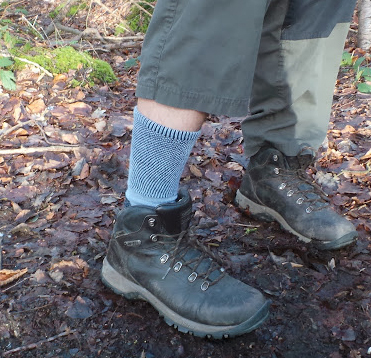 However, the next time I am going on a longer hike and am going to ensure that I am stocked up on the British made Sockmines! What is more, I now know that I can wear my rather expensive hiking boots again. Luckily, I will have chance to buy some more at the British Family Fayre in August as Sockmine are going to be there with their workshop! I can also throughly recommend Selina Scott’s goat socks http://www.selinascott.co.uk for both walking socks and everyday wear. As I throw old socks out I’ve been ‘treating myself’ to a pair of these every so often, as not found anything as comfortable before.